Test your wits against some of Cranford’s sharpest minds. Doors open at 6:30 pm | Trivia 7:30 pm. $350 per team | maximum of 10 players per team. DJ Randy Geis! | T-shirts for each team member | Spirit Award Prizes Beer & wine tickets (20) for each team | Full Cash Bar available B.y.o. food: dinner, appetizers, snacks, or desserts. 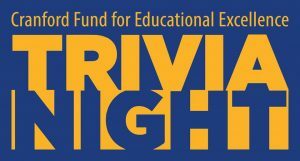 The funds raised by the CFEE go directly toward innovative educational grants, written by teachers or administrators, that impact and advance teacher instruction and student learning in the Cranford Public Schools.